The Violence Against Women Act (VAWA) is a landmark piece of legislation first passed in 1994 that addresses domestic violence, sexual assault, dating violence, and stalking. VAWA protections and programs support organizations working with survivors, and enable a coordinated community response to domestic violence and abuse. The legislation needs to be reauthorized periodically and the current legislation is set to expire in December, 2018. As the nation's largest victim services organization, VAWA funding supports our partnerships with district attorneys, the courts, and the NYPD. It also allows us to provide legal services to survivors who are facing divorce and custody battles with their abusers. 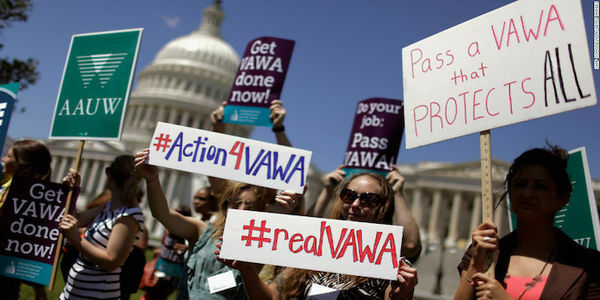 Reauthorizing VAWA will enable these vital, and in some cases lifesaving, services to continue. In July 2018, the Violence Against Women Reauthorization Act of 2018 was introduced in the House of Representatives. Please sign our petition to members of Congress below to advocate for its passage. Thank you for your support; your actions truly make a difference to protect victims and promote safety. - Closing loopholes to reduce gun violence related to domestic violence. VAWA is essential to ending domestic violence and abuse, and it must be reauthorized this year. Thousands of survivors that Safe Horizon works with and hundreds of thousands of survivors across the country are impacted by this legislation. Please make protecting people from violence a priority and support this bill as proposed. Thank you for your attention to this matter and for standing with us and working towards a society free of family and community violence.